Washington, DC—Senator Patrick Leahy (D-VT) took to the floor of Congress yesterday to voice his support for the international organized crime-fighting commission in Guatemala, CICIG. Leahy’s statement was a pointed rebuke of Florida Senator Marco Rubio for his recent decision to place a hold on U.S. funding for CICIG. Leahy was also pushing back against Rep. Chris Smith (R-NJ) and other Republican senators for a hearing they held in April to air grievances about CICIG’s role in Guatemala. Why has Senator Rubio moved to block U.S. funding for CICIG? 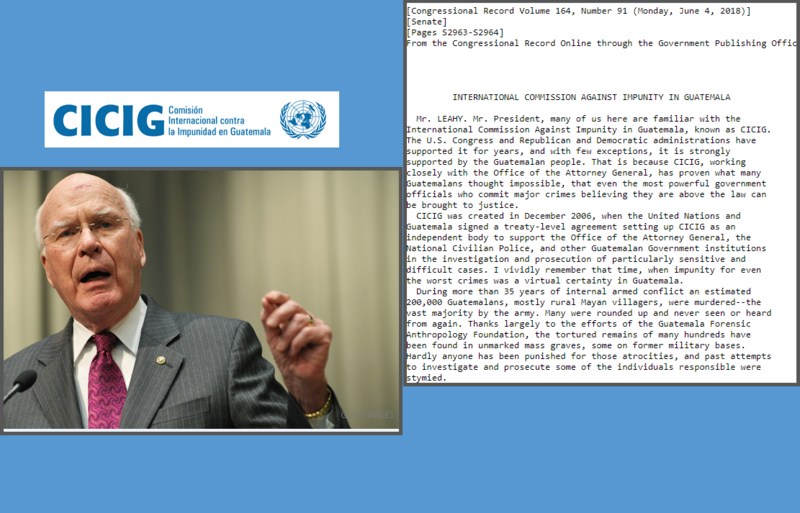 What motivated Rep. Smith to organize a hearing under the auspices of the “U.S. Helsinki Commission” to lob criticisms CICIG and its investigations in Guatemala? And how did a Russian family get in the middle of this story? Across Central America, public prosecutors are taking on a key role in investigating and dismantling deeply rooted organized criminal networks. But Guatemala’s widening corruption probe, which brought down a sitting president, Otto Perez Molina, in 2015 and threatens to implicate the current president, Jimmy Morales, as well as scores of others, has triggered a backlash from entrenched economic and political elites who want to protect themselves from future investigations. Foes of the U.N. anti-impunity commission, known as CICIG for its initials in Spanish, seemed to score a hit in early May, when U.S. Senator Marco Rubio announced he would seek to freeze $6 million in U.S. funding for CICIG. The United States provides about 40 percent of the commission’s funding. Rubio’s announcement came days after the U.S. Helsinki Commission, a federal agency, held a hearing on CICIG’s alleged malfeasance in a case in Guatemala involving the wealthy Bitkov family. The Bitkovs are self-proclaimed Russian exiles convicted in Guatemala in January 2018 of identity fraud as part of a broader probe against a criminal ring within the Guatemalan immigration office that is accused of selling false passports. In April, a higher court in Guatemala overturned the Bitkovs’ conviction. Despite accusations raised during the recent congressional hearing in Washington, there is no evidence of Russian government influence over CICIG in the Bitkov case or any other case in Guatemala. CICIG does not receive funding from Russia. The Bitkov controversy is really just a sideshow, a piece of a much larger lobbying effort spearheaded by conservative political and economic sectors within Guatemala to discredit and weaken the anti-corruption commission. Why do these sectors oppose CICIG, and how have they won a U.S. senator’s support? Will Guatemala’s new attorney general cooperate with CICIG even when it means pursuing politically sensitive cases? CICIG was created in 2006 at the request of the Guatemalan government and with the support of the United Nations. Its mandate is to help investigate and bring to justice cases of corruption and criminality, including drug-trafficking, graft, money-laundering, tax evasion and other financial crimes. CICIG provides technical assistance to the Guatemalan Public Ministry and can serve as an “adjunct prosecutor” in select cases. Many of CICIG’s early cases focused on Guatemala’s so-called “hidden powers,” shadowy criminal networks that gained influence during the decades of military dictatorship and counterinsurgency warfare in Guatemala. Active and retired military personnel, particularly those linked to army intelligence, used their government connections to expand their illicit activities, such as moving contraband and illegal drugs, facilitating illegal adoptions and human smuggling, issuing false government documents, and skimming hundreds of millions of dollars from public coffers. 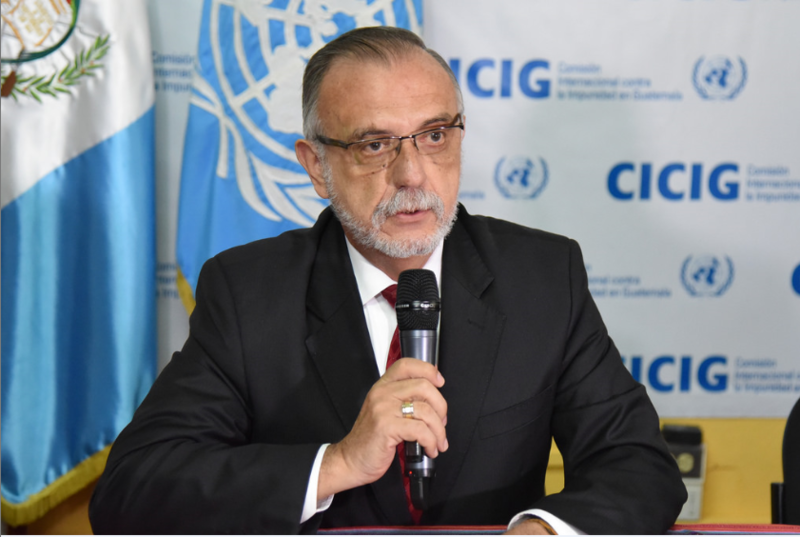 CICIG’s work accelerated after 2013 under the direction of Ivan Velasquez, a veteran prosecutor from Colombia who is now the target of attacks by those threatened by the commission. The lobbying effort to discredit CICIG got serious in December 2016 after Donald Trump was elected U.S. president, and CICIG’s foes within Guatemala thought they had an opening. A group of right-wing businesspeople went to Washington for meetings in Congress to call for the removal of then-U.S. Ambassador Todd Robinson, whom they saw as overstepping his diplomatic role by vigorously defending CICIG. One of them was Betty Marroquin, a conservative columnist and political analyst, who has since played a leading role in the anti-CICIG campaign. The lobbying escalated during Trump’s first year in office, as four Guatemalan congressmen hired the law firm Barnes & Thornburg—already under contract to represent President Morales, who faces corruption charges of his own—for $80,000 a month to help them lobby U.S. lawmakers. Last August, Morales tried to expel Velasquez, after CICIG and the Public Ministry linked him to illicit campaign financing and sought impeachment proceedings. The president’s maneuver was blocked by the Constitutional Court and condemned internationally, including by bipartisan congressional leaders in the United States. In February, Guatemalan Foreign Minister Sandra Jovel tried—and failed—to convince U.N. Secretary-General Antonio Guterres to issue a statement condemning Velasquez’s leadership of CICIG. Velasquez has been widely praised by Guatemalan civil society and by the international community. Although some news outlets reported, erroneously, that Rubio had succeeded in suspending U.S. funding for CICIG this month, in fact, American support for the commission remains intact. Rubio’s “hold” on funding is just a request that is not likely to go anywhere in Congress. The anti-graft commission continues to be praised by U.S. lawmakers, the State Department and the new U.S. ambassador in Guatemala City. Guterres offered his continued support for Velasquez shortly after last month’s misguided and sparsely attended hearing in Congress. CICIG is seen as a model for anti-corruption efforts elsewhere in Central America and even Mexico. A bipartisan bloc of U.S. lawmakers consider these anti-corruption measures key to addressing perceived American security threats in Central America, such as transnational crime and migration. Public opinion in Guatemala is also strongly in favor of CICIG; a recent survey by the respected pollster Latinobarometro found that CICIG is the most trusted institution in Guatemala. Rubio’s intervention is not likely to make a dent in U.S. support for CICIG. But it may further destabilize the political situation in Guatemala. Less than a week after Rubio’s announcement, the Guatemalan government demanded that Sweden withdraw its ambassador to Guatemala, Anders Kompass, after Kompass announced a new round of Swedish financial support for CICIG and praised the anti-corruption efforts. Guatemala’s new attorney general is entering a volatile political scene. Just days before Porras took office, prosecutors in Guatemala presented new evidence against Morales. Porras’ prior career, during which she held several positions within the Public Ministry before becoming an appellate judge, does not mark her as a crusader. She was named to her post by Morales from a slate of other candidates. Certainly, she will face intense pressure from entrenched elites to slow or even reverse the gains made in prosecuting organized crime in Guatemala. Then again, human rights groups had the same doubts about Porras’ predecessor, Thelma Aldana, who nonetheless unleashed a wave of high-level cases. The reactionary forces of the status quo in Guatemala are well-heeled and accustomed to winning. But Guatemala’s citizens are increasingly emboldened to demand justice and an end to impunity for crimes and corruption. They deserve the support of Americans, and their elected representatives.